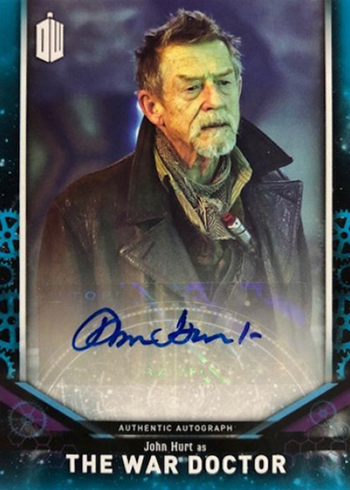 2018 Topps Doctor Who Signature Series is living up to its name. There are no tradition base cards or inserts. One pack, one card, one autograph. That’s it. 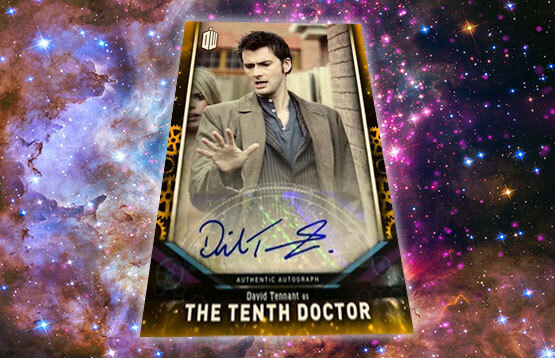 A follow-up to the autograph-heavy 2017 release, this time Doctor Who Signature Series is an online-exclusive on the Topps website. Each pack costs $20. 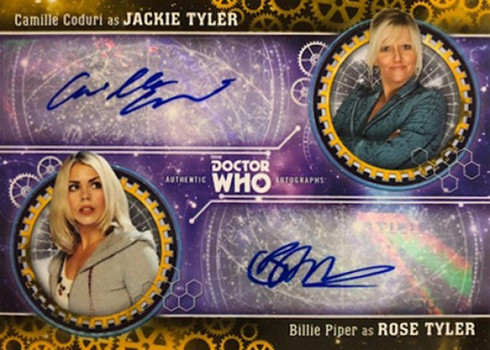 The bulk of the 2018 Topps Doctor Who Signature Series checklist is basic autograph cards. It consists of 78 cards. David Tennant (The Tenth Doctor), Billie Piper (Rose Tyler) and the late John Hurt (The War Doctor) are among the signers. Dual and triple autographs are also randomly inserted. But what is the product/odds? If all of the single autos are of the same production numbers its “OK”, but I’m sure they will short print the better cards. And, why is there no Tom Baker? 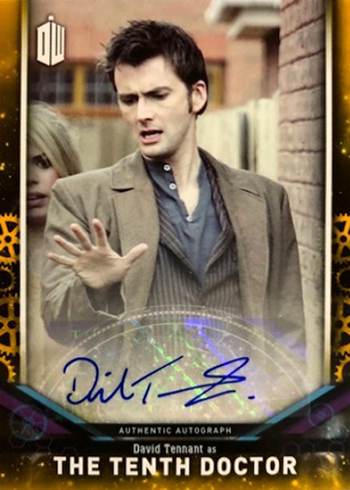 Why does ever other company that has made Dr. Who cards manage to get on-card autographs but Topps won’t? 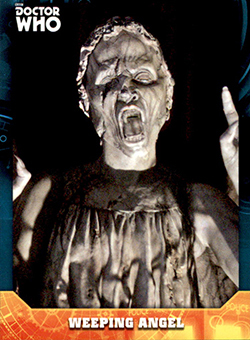 @Richard — Short prints wouldn’t be surprising as they have been in all of Topps’ Doctor Who products. As for stickers vs. on-card, that’s something you’d need to ask them. It may have something to do with the fact that they’re primarily US based and some of the past companies have been in the UK where the film is made and BBC is headquartered. Not sure. 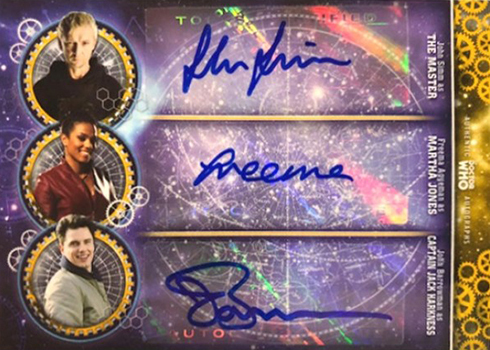 Could it be that Topps are clearing their stocks of Dr Who signature stickers? Did Tom Baker sign for Topps originally, if not it would explain his absence if they are clearing out. 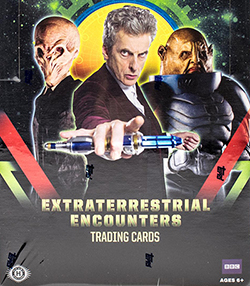 Note also that Topps reverted to signature stickers for all their products some time ago not just Dr Who. 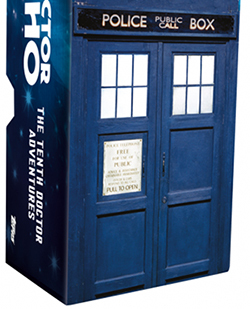 @John — It’s possible Topps could be winding down their Doctor Who line. It’s also possible they found autographs were the big draw and this was a way try something different and cut costs. Tom Baker has signed for Topps before — mostly stickers but some on-card for Star Wars. Topps has been using stickers for a while but there has been a shift to more on-card with other licenses. Nearly all basic autographs in The Walking Dead are hard-signed. Star Wars has a fair number of on-card, although it’s a mix. Doctor Who for them has always been stickers. Many thanks for the update re Topps current attitude to autographs. I certainly was not aware of the hard-signed cards in any of their franchises. I clearly have been not paying attention in the right areas.